A year ago, Dan Williams moved from his home near Ione's Willow Creek wind farm to Walterville, Ore. He said he couldn't take the noise of whipping turbine blades any longer. "It's hard to explain it to people unless you experience it," Williams said. "There's the actual noise that wakes you, but there's also the infrasound you can't hear but your body feels. The best I can describe it is like a train or an airplane coming and going." Williams filed a lawsuit Friday against Invenergy, the Illinois-based company behind the wind farm, for non-economic losses up to $5 million, as well as economic losses -- mostly related to property value depreciation -- for $170,000. Since Invenergy began construction on the 50 wind turbines at Willow Creek in 2008, it has fought in the courts over noise compliance. First, the fight was over the actual noise limits. Invenergy said the Morrow County noise limit of 50 dBa was acceptable, Williams and a few neighbors argued that the wind farm had to comply with the state limit of 36 dBa. Although neither enforced it, both the county and the state upheld the 36 dBa limit in seven different court findings. "I'm extremely disappointed that county and state of Oregon both agree that there's violations but won't do anything about them," Williams said. After a 2009 noise study conducted on Williams' property by Invenergy showed turbine noise levels reaching 42 dBa, the wind company embarked on an effort to comply with the noise levels through methods such as triggering turbine shut-downs at certain noise levels. Williams is also claiming the current technology takes too long to shut down after the noise limits are reached. In the complaint filed Friday, Williams claims "emotional distress, deteriorating physical and emotional health, dizziness, inability to sleep, drowsiness, fatigue, headaches, difficulty thinking, irritation and lethargy" as a result of the turbines' noise and flickering glare. In a statement issued Friday, Invenergy said it wasn't aware of any alleged health effects to Williams until he filed the lawsuit and would "vigorously defend" itself against his claims. "Notwithstanding the non-specific nature of these claims, it's important to reiterate that numerous rigorous studies ... have found no evidence to support a link between adverse health effects and sound emitted from wind turbines," the company stated. According to the U.S. Department of Health and Human Services, a noise level of 40 dBA is equal to a running stream or refrigerator humming, 30 dBa is a whisper and 50 to 60 dBa is a quiet office. But Williams' attorney, Jim McClandish, who did not want to talk specifically about the case, argued new research shows low-frequency wind turbine noise could be dangerous. 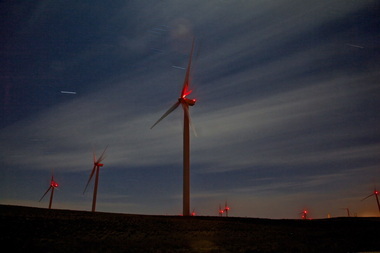 While "wind turbine syndrome" was once pure speculation, recent studies show the low-frequency infrasound can cause symptoms such as the dizziness and nausea Williams said he experienced. "The reverberation at low frequencies affects people's inner ears. It impacts their ability to sleep, their concentration," McClandish said. The lawsuit is expected to take at least a year to make its way through the courts. Williams still owns his Ione home. He said even though he has left the property, he has no plans to stand down. "What other option do I have?" Williams said. "I was there first. This was forced upon me. I'm a human being with strong convictions."